I have been chanting Buddhist Sutras over the past thirteen years, twelve of which have been at my beautiful Temple Hua Zang Si. I have always enjoyed chanting, however, it was not always easy for me…. I got tired quickly and my throat would hurt, my mind was also scattered while chanting. I would faithfully chant at our Dharma Assemblies, fish releases and evening chanting services. Over the years I never experienced any changes in my challenges! In June of 2014 things changed…..
My husband left this world! At that time, I was teaching at special education school and was on my summer break. I volunteered every day at Hua Zang SI and attended the evening chanting services lead by the monastics of the temple. I did this for two months. Each night while chanting the Amitabha Buddha Sutra, I wanted to cry. However, I knew deep in my heart more than ever I need to remain concentrated and beseech Amitabha Buddha to guide him to the Buddha land of ultimate bliss. I chanted each day for the next two months with all my heart and concentration on the sutra. Today, I still continue to chant at Dharma Assemblies and on my day off, I joyfully take Bart to the temple in San Francisco to attend evening chanting from 5-6 pm along with the Sangha. Chanting along with the Sangha has become very Auspicious for me! I no longer struggle with my chanting, my throat does not hurt and I do not feel tired and am more concentrated…….I actually feel blissful! The monastics also mentioned to me that my chanting is beautiful! I can say for certain, the reason I have experienced such transformation is due to my deep sincerity, devotion and faith in the Buddha Dharma of H.H. Dorje Chang Buddha III and with a pure heart, the wish for another living being to be guided by Amitabha Buddha to the Buddha land of ultimate bliss as to leave the cycle of reincarnation. 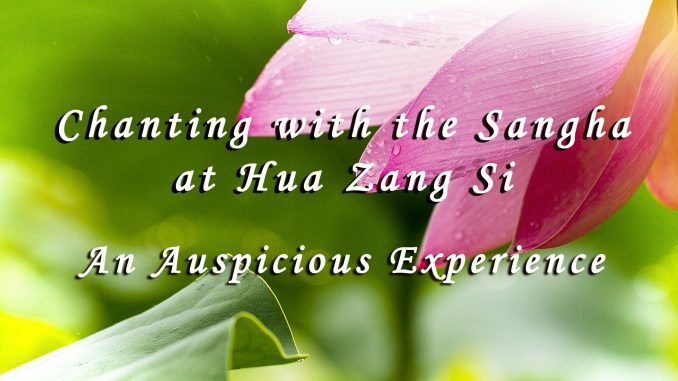 I deeply thank the monastics of Hua Zang Si….your beautiful, angelic, voices have guided my ears in my chanting. The Buddhas have blessed me with the voice, to chant…..freely!